Mustafa continues to be an industry leader with her work around parental support and equality. The vision for Third Door, which is in London, is to scale to 10 locations and eventually go nationwide. Shazia Mustafa is a true coworking pioneer. 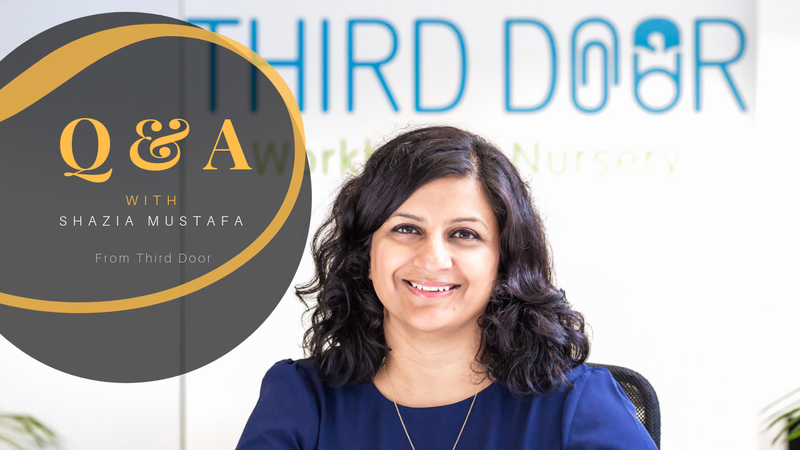 Founder of Third Door in London, the first coworking space with childcare in the world, Mustafa has championed gender equality and workspace support for parents for nearly a decade—and she’s still at it. Now, in addition to running Third Door and its in-house, full childcare center, she’s on the policy committee of the Women’s Equality Party in Britain, working on policies in support of equal parenting leave and care, equal pay, equal representation and more. Allwork.Space spoke with Mustafa about her own struggles starting a business as a new mother, her vision to scale Third Door, and how she’s working to create a world where parents are supported in creating healthy lives, healthy families and healthy businesses. Here are the highlights of our conversation. Allwork.Space: When you opened Third Door, you were doing something that no one else had, driven by your own need for a parent-friendly workspace. Tell me a bit about your mindset at the time, which was in the early days of coworking. How much did you know about the coworking movement then? Shazia Mustafa: I knew nothing about the coworking movement when I had the idea. I’ve always wanted to start my own business. When I met my husband in 2003, I remember telling him on our first date that I wanted to start a business. He asked what I wanted to do, and what was stopping me. When I had my first child, I was trying to think of what I could do. We weren’t even thinking about anything like coworking, it was literally a case of not being able to get anything done. We were looking for anywhere we could go, where we could drop the children off nearby, and work. Because my background is in insight and research, I started researching and I found that freelancers wanted to work around their children. When I looked at offices, I found Regus, and that wasn’t what I wanted. Then I came across Impact Hub, which was just called Hub at the time, and I thought that was too trendy—I wanted something in-between. Then I came across Alex Hillman [of Indy Hall] and Tony Bacigalupo [of New Work Cities] and what they were doing with community and a professional space. It was exactly what I had in my head. When we opened, there were still not that many coworking spaces in America. In London, there was us, the Impact Hub and a few others that I’m not sure are still around. I had nothing to base the coworking aspect on, apart from the things I read and Impact Hub. With the childcare, we interviewed the lady from Cubes and Crayons in the San Francisco area. We did so much research—we went out to the baby show they have in London and we stopped parents and interviewed them. They said they’d like to work near their children. No one was doing flexible childcare—it was such a novel idea at the time. Allwork.Space: You’re still way out ahead of everyone else, having a full childcare space within a coworking space. Here in the States, a growing number of spaces are opening that offer childcare for four hours per day, or else they’re partnering with a childcare center. Your model, with two distinct businesses in one, is still novel. You’re basically running two businesses, correct? Yes. I think we make it look easy, but it hasn’t been easy at all. It’s been quite a difficult journey. When we started, my daughter was 2 and a half years-old; by the time we opened, my son was six months old. The first two years were such a blur, then I found out we were expecting our third child 18 months into the business. The first two years of any business are difficult, and we made it harder by having three children. What makes Third Door different is, because of my background, I’ve always focused on what the customer wants. We’ve adapted really quickly to feedback. When we first opened, we thought people would use us to complement other childcare. We quickly learned that our price point wasn’t right. We were only offering two products: 15 hours per month at a very high price, and ad hoc, drop-in childcare. Also at the beginning, parents were bringing their own food and nappies. People were asking if they could put their child in for the full day, so we adapted very quickly. Even though we offered the whole combination, we were still being compared against regular childcare and regular nursery. Some people didn’t want to pay for the work hub, they just wanted childcare, and some people just wanted the work hub and meeting room, so we adapted across that. Right now it works really well because we have a price point that’s inclusive of everything. We make it as easy as possible on working parents, so the price includes classes, meals, nappies—so parents get a lot more value. We invoice at the beginning of the month then, if they do any extras, we charge them at a more premium point for that. People can do flexible booking, or swap days, or change packages over time to save money. Allwork.Space: That flexibility piece is such a big part of coworking. Parents, and members, in general, want to be able to come and go as they need, and adjust their membership if their schedule changes. Exactly. It’s like with any business, you have your core, the people who use us every day full-time. They don’t really change their days and they get a better price point. If you have the flexible membership, you pay more for it, but you have the flexibility to either use all the hours in one week, or do longer days and shorter days depending on what you want, at the higher point. If you do any extras according to that package, you pay for those at the end of the month. Allwork.Space: Just a couple of years ago, having a coworking space that offered childcare was really niche. Now I regularly see people opening family-friendly spaces and spaces with a childcare component. Do you see that in the UK? And what’s your perspective on the trend of childcare in coworking? We came from a different angle in that we’ve attracted people who are already parents, or new parents looking for childcare and a place to work. Where coworking is changing is that those members they had in the beginning have grown up and they have children, so now they’re slotting it into what they’re doing. I don’t know if having a coworking space then slotting in the nursery is going to work as effectively as thinking about the customer—with everything we’ve done with the design—then creating the space. Even today, we’re constantly thinking about our customer. They’re busy, they’re frazzled, they’re usually quite anxious about putting their child in care. We’ve changed our nursery quite a lot recently—we got rid of a lot of plastics to make the space sustainable—and children prefer playing with natural resources. I’ve got qualifications in childcare, so I don’t have people telling me what needs to be done, I know exactly what needs to be done and I can hold that vision when we scale up. Allwork.Space: As a pioneering space operator, what would you like to see in this industry and the coworking movement when it comes to family-friendly spaces? I know it’s different in America, but I think people almost pretend they haven’t got a family—especially men. At work, you don’t talk about your children, you just get on with it. People are so frazzled all the time. It’s not good for your mental health. I would like our model to eventually be available nationwide. I think this model can work really well for people in disadvantaged communities. So many people do want to start their own businesses and there are lots of different ways we can help people and give back. I was just thinking today how I could get a company to sponsor some spaces so someone who can’t afford childcare can start a business. There are lots of initiatives I can still do. Allwork.Space: There’s plenty of room for improvement when it comes to providing support for parents. It’s so old fashioned that people still think childcare is just a mum thing. If the dads want to take parental leave, they can’t. In the UK, you have a baby and the dad’s back at work two weeks later—and that’s if he has a good job and can afford to take the time off. They all live in the same house, they’re all sleep-deprived, and more and more men do want to spend time with their children. Just last week, there was a company in our meeting room training mums how to go back to work. One woman said she wanted to become a nanny, and the instructor asked her how she was going to become a nanny when she had her own child. She just had no idea what she wanted to do, but there were 20 women in that room who all want to work. Allwork.Space: One of the things I love about coworking is that it draws out people’s individual passions and knowledge and, ideally, helps them realize their potential. It’s hard to think about women losing their confidence after giving birth when there’s so much potential there, and so much they can share. You’re looking after a child, you’re wondering if you’re doing it right, and you’re sleep-deprived. I think Third Door saved me because I had something to focus on and I could see that what we were going to create would make a difference for people. Allwork.Space: What’s next for Third Door? You mentioned scaling and potentially going nationwide. Our vision has always been to have more than one location. We’ve had a couple of false starts opening a second one, where I’ve pulled away and thought it wasn’t the right opportunity. As the result of that, we’ve really looked at what we’re looking for. It goes back to values. For me, having people who are aligned with our values has made a huge difference—having customers that share our values, but also working with suppliers that share our values. I want to work with companies that are ethically-minded, like we are. I can’t even look past two or three locations, at this point, but we’re looking to open 10 in the next five years. The market is changing, so we’ll see what’s happening. We’d also like to be able to sell the software we’ve created to existing nurseries so they can offer the flexibility. Allwork.Space: What’s your big picture vision around your work? The change I want is that, by the time my children have children, we’re not having the conversations we’re having now about women returning to work, and mums and dads being able to work near their child with flexible coworking. The thing we can do is open more sites and use our software for existing nurseries giving them some flexibility. And we’re very interested in the whole equality side of this. I’m having quite a lot of conversations around that. I’ve got the knowledge, but it comes from the heart, as well. I wouldn’t be doing this if I didn’t care.